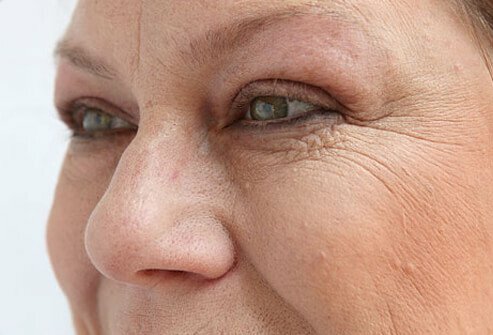 Skin thins and dries with age, so lines and wrinkles start to appear. Applying primer before you put on your makeup helps minimize the appearance of fine lines and pores by filling them in. This way your skin is a smooth blank canvas for you to apply your makeup. Skin primer does not get rid of fine lines and large pores, but it can help both appear less visible. 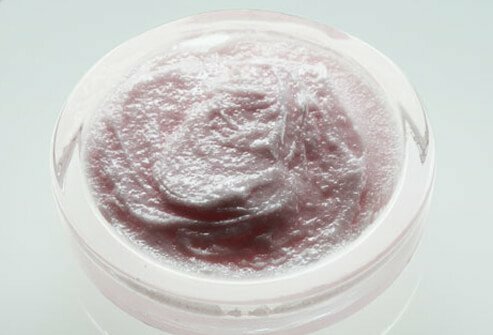 Silicone is a common ingredient in skin primer that works well for the purpose. Foundation is great for making your skin tone appear even and smooth. 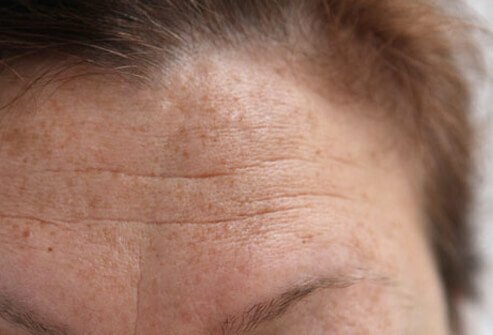 It can hide imperfections like freckles, age spots, scars, and other problem skin issues -- but, if you apply foundation too thick or too heavy handed, it can actually make you look older because it sinks into lines and wrinkles, making them appear worse. Here is the right way to apply foundation. First, clean and dry your face. Next, apply moisturizer appropriate for your skin type. Then, apply primer. Now you are ready to apply foundation. Use a light touch and a sponge applicator to dab the product over your entire face. Blend color carefully on the edges of your face and at the jawline so you avoid having a severe line between skin areas with and without foundation. Apply foundation sparingly. A little goes a long way. Eyesight tends to decline with age. Most people need glasses after the age of 40. 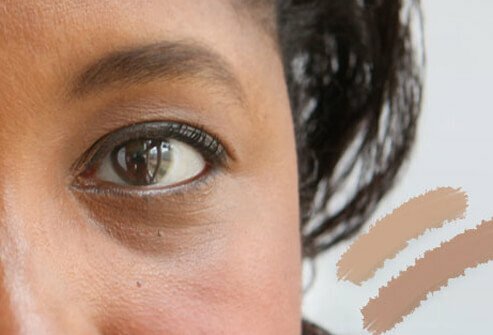 Your inability to see well may affect your ability to be precise when applying makeup. No one wants to look like a clown! Invest in a good magnifying mirror and use it when applying makeup, especially eyeliner, eye shadow, and mascara. A magnifying mirror is also a very useful tool to have on hand when you are grooming or filling in eyebrows. See your ophthalmologist for regular eye exams to make sure you have an adequate prescription for your eyeglasses or contact lenses so you can see clearly. Eyelids get droopy as we age, and eyelashes and eyebrows may become more sparse. Draw attention to your best features. Apply eyeliner in a color that makes your eyes pop. Apply a thin line of eyeliner along your upper and lower lash lines. This will make your eye lashes appear thicker. Use a complementary color of eye shadow on your upper lid. Use softer shades of eye shadow as you get older, and apply minimal product. Heavy, caked-on eye makeup makes you look older. Eyebrows tend to become thinner and gray as we age. Since eyebrows frame the face, their appearance impacts how youthful you look. Fill in and darken aging eyebrows. Use an eyebrow pencil that approximates your hair color to fill in sparse areas. Use eyebrow powder over penciled in areas to help the color set. Avoid using colors that are much darker than your hair color. Eyebrows that are too dark will look unnatural and will age you. 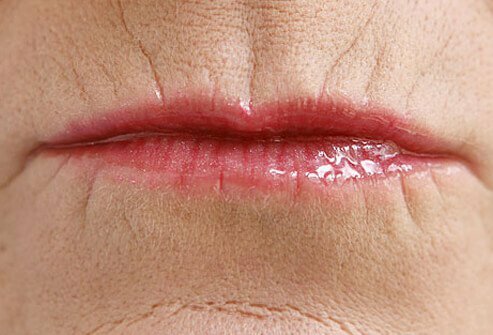 It is normal to develop lines around the mouth as you age, but lipstick that bleeds into these lines will only accentuate their appearance. You can keep lipstick in place by using a few tried and true tips. First, apply moisturizer to your lips. Next, apply a light coat of foundation to them using a light touch and a sponge applicator. Line lips with a lip liner that is the same shade of color as your lips. Lastly, apply lipstick in a flattering shade. You can then dust a bit of powder over your lips to set the color and help prevent bleeding. Lips tend to thin and lose volume as you age, but you can use some tricks to make them appear younger and fuller. After moisturizing and applying foundation to lips, use a lip-colored lip pencil to line them. Make sure to use a color that blends in with your natural lip color. Lining lips with a color much darker than your natural lip color will look unnatural and could make you look older. Stick to colors that are light or neutral, which will make you look younger. You can even try a lip-plumping lipstick or lip gloss. The effect may be modest, but it may help your lips look a little fuller. Chapped, flaky lips are a common problem. You can combat dry lips by moisturizing them often. Apply lip balm containing petroleum jelly, vitamin E, shea butter, or a combination of these, often. Get a product that also contains sunscreen to protect delicate lips from the UV rays of the sun. Sun exposure can damage skin, including the skin of the lips, especially if you burn. You can also use a mild lip exfoliating product to remove dry flakes. If you use long-wearing lipstick, make sure the product dries completely before you apply lip balm over it. Coffee, tea, cola, and wine are just a few beverages that can stain tooth enamel. Smoking also stains teeth. Having stained teeth can make you look older. Combat stains by using an over-the-counter whitening toothpaste. For more intense results, use over-the-counter whitening strips or gels. These products work by bleaching tooth enamel. If you need more help, talk to your dentist. In-office treatments are available that can make teeth look much whiter. Some types of treatments require multiple visits to achieve the best results. The eyes are a central feature of the face. Their appearance can make you look older or younger depending on several factors. Eye puffiness and dark circles may make you appear older than your actual age. Minimize dark circles by getting enough sleep. Lack of sleep triggers dark circles. If you have allergies, treat them, as allergies can make you get dark circles around your eyes. Salt makes you retain water, so minimize sodium in your diet to reduce the risk of undereye puffiness. 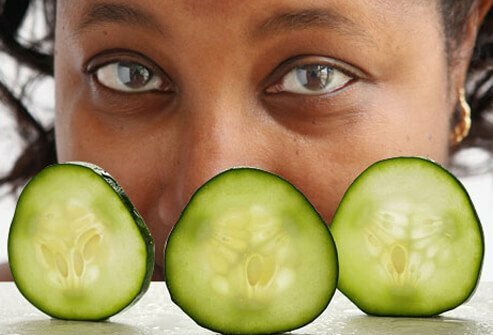 Place cucumber slices or moist tea bags under your eyes to combat puffiness. Getting adequate sleep may help you avoid dark circles under your eyes. 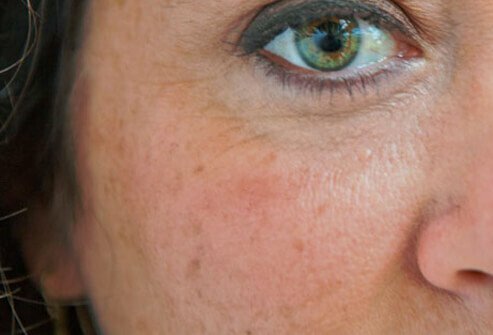 Some people have skin pigmentation that makes the skin under the eyes appear darker than the surrounding facial skin. If you have this problem, products containing hydroquinone, retinol, vitamin C, and green tea may make dark circles appear lighter. Dab undereye concealer on the delicate skin under the eyes to conceal dark circles. The concealer should be slightly lighter than your actual skin tone. Choose a concealer with a yellowish tinge to conceal dark circles. Sunglasses fulfill multiple roles if your goal is to look younger. Wearing sunglasses while outdoors helps keep you from squinting, which in turn minimizes the risk of developing or deepening crows’ feet and wrinkles around the eyes. Sunglasses also reduce your risk of developing cataracts, cloudy growths that develop on the lenses of the eyes and interfere with vision. Make sure the sunglasses you choose are labeled UV 400 for maximum protection. 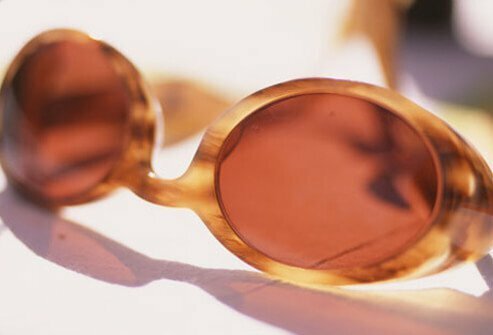 Sunglasses also help shield your skin against damaging UV rays from the sun that lead to premature aging and wrinkles around thin, delicate eye skin. Apply broad-spectrum sunscreen daily to help protect against premature aging, brown spots, and skin cancer. YHair thins as you age. You can make it appear fuller by using some clever styling tricks. Use a large barrel brush to lift hair at the roots while blow drying. This adds volume. Switch to the cool setting on your hairdryer to help set the style. You can put your hair in hot rollers to add body and volume to hair. If you prefer a more low maintenance option, consider getting a perm. 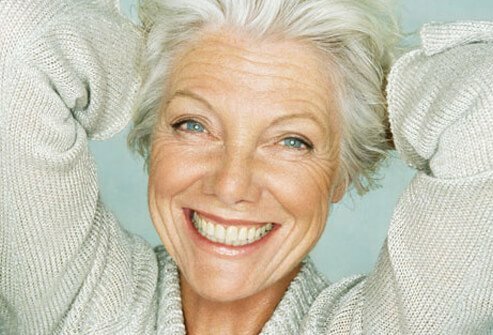 In this day and age, many women are choosing to go all natural and let their hair go gray. Use deep conditioner regularly to keep hair looking shiny and healthy. If gray hair does not complement your skin tone, consider adding some color to brighten your look and keep you from appearing washed out. 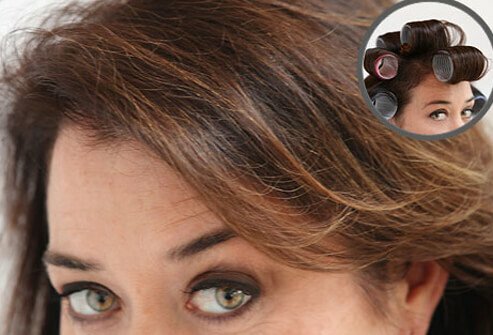 You can find effective over-the-counter products to hide your gray hair at home. Proceed with caution. Never use these products on eyebrows or eyelashes near the delicate eyes. Skin cells do not turn over as rapidly as they once did as you age. The result is that surface skin may appear rough, uneven, and blotchy. Make regular exfoliation part of your anti-aging skin care routine. Use a soft washcloth and an exfoliating cleanser to gently remove dead skin cells from your face and body. This reduces the appearance of dull, flaky skin. Use a gentle hand. Exfoliating too aggressively may irritate your skin, leaving it red and splotchy. Retinoids are compounds that are similar to vitamin A. Regular use of retinoids helps reduce the appearance of fine lines and wrinkles. This promotes healthy, younger-looking skin. The strongest creams containing retinoids are available with a prescription from your doctor. Tretinoin, adapalene, and tarazotene are a few types of prescription retinoids. A milder version of these products, called retinol, is available over the counter (OTC). You will get the best results from retinoid products if you use them regularly. You will see improvements within several weeks to months of use. Start slowly if you are using retinoid products for the first time. They may cause redness, peeling, redness, and increased sensitivity. Apply the product less frequently or switch to a reduced strength retinoid if you experience these side effects. Alpha-hydroxy acids (AHAs) are acids found in foods like fruits, milk, sugar cane, and other foods. AHAs are chemical peels that remove the top layer of skin cells, thereby improving the appearance of wrinkles and fine lines. Glycolic acid is an alpha-hydroxy acid derived from sugar. Results of these peels may be more pronounced when used around the skin of the eyes. AHAs are good for crows’ feet. Side effects of these peels are minimal. They may cause temporary redness, irritation, and increased sensitivity to the sun. Hydroquinone is the ingredient in lightening, or bleaching creams, that fades age spots. It acts on the production of melanin, the pigment that is responsible for the color of age spots. Hydroquinone is available in both over-the-counter and prescription products. Another active ingredient in some lightening creams is called kojic acid. It is an agent that is made from several types of fungi. Kojic acid is available in both over-the-counter and prescription strength products. 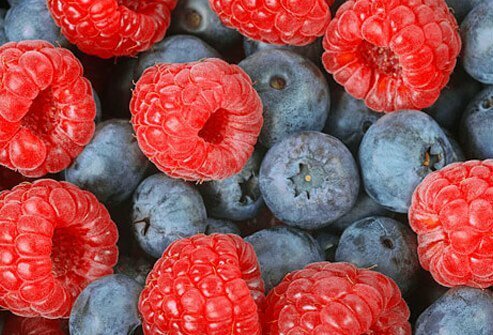 Antioxidants are vitamins and other compounds that protect cells against damage by free radicals. If you want healthy skin, eat a diet rich in antioxidants that includes plenty of fresh fruits and vegetables. The more colorful, the better. The pigments that give fruits and veggies their color are protective to the skin. You can also apply creams and serums that are rich in vitamin C to the skin. Ask your dermatologist for a recommendation for a product that has a high dose of vitamin C, which is proven to be effective at improving the appearance of the skin. Salmon is a great protein choice for your skin, because it gives your body the building blocks it needs to build healthy tissues, including skin. It is also rich in healthy omega-3 fatty acids. These fats are anti-inflammatory and keep your skin plump, thereby minimizing the appearance of wrinkles. It is recommended that most healthy people eat at least 2 servings of fatty fish per week. One serving is about 3.5 ounces of fish. 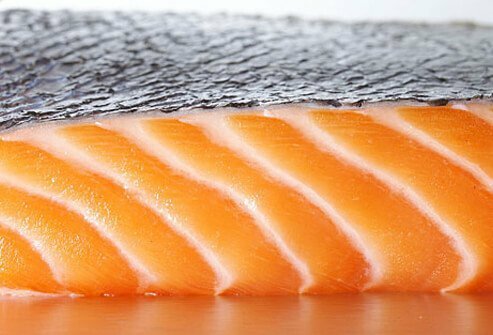 Fatty fish include salmon, trout, herring, mackerel, albacore tuna, and sardines. The skin on the hands is thinner than it is on other parts of the body. There is also not much fat beneath the skin on the hands, so the tissue looks less plump. When hands get dry, the skin can become crinkled. Fight the appearance of aging hands by applying moisturizer several times daily to your hands. Helpful ingredients to look for in hand moisturizers include glycerin, hyaluronic acid, safflower seed oil, and shea butter. If you get age spots on your hands, use lightening creams with hydroquinone to help them appear lighter. 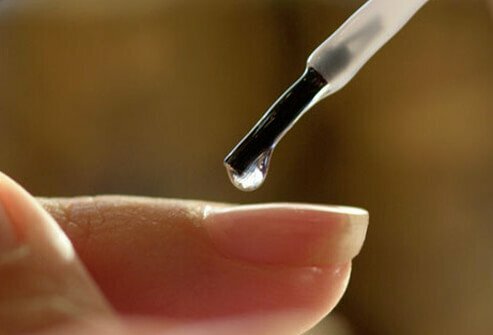 Nails may become more brittle with age. Keep your nails from breaking and peeling by moisturizing your hands and nails with a thick cream or petroleum jelly. You can put cotton gloves on overnight after applying cream or petroleum jelly to deeply moisturize hands while you sleep. Avoid harsh, drying soaps, which may further dry out nails. Trim your nails straight across to minimize the risk of hangnails and ingrown nails. Nail clippers are shaped to approximate the curve of the nail to making trimming easier. Smooth rough edges using a nail file. The skin on the bottoms of our feet, especially the balls and heels, thickens with age from decades of walking. Remove thickened areas with a pumice stone after soaking your feet in hot water. You can also use thick creams or petroleum jelly to soften dry, thick heel skin. Similar to deep moisturizing hand treatments, you can apply a thick cream or petroleum jelly to the bottom of your feet and put socks on overnight to deeply moisturize your feet. Keeping your heel skin moist may help guard against cracking. 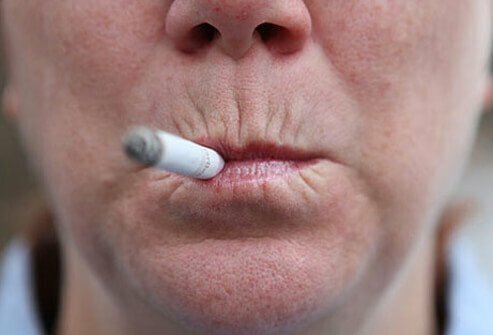 You may not think one has anything to do with the other, but smoking is very bad for your skin and promotes skin aging. In studies of twins, the sibling who smoked had more wrinkles and skin that was up to 40% thinner than the skin of the sibling who did not smoke. The twin who smoked also developed undereye bags and more wrinkles around the lips compared to the twin who did not smoke. Smoke may produce an enzyme that damages collagen and elastin, two components that are vital to maintaining the skin's structure and elasticity. If you need help quitting, talk to your doctor about treatments that can help you kick the habit for good. Women who get too much sun exposure or who have suffered repeated sunburns may look a few years to many years older than their actual age. That is because UV rays from the sun contribute to skin aging. Get in the habit of applying a broad-spectrum sunscreen every day to protect against both ultraviolet B (UVB) rays and ultraviolet A (UVA) rays. Sun protection factor (SPF) on sunscreen refers only to the amount of protection that a sunscreen confers against UVB rays, the ones that burn the skin and increase the risk of skin cancer. It is actually the UVA rays that contribute to wrinkles and skin aging. Wearing a broad-spectrum sunscreen will help protect against both types of damaging rays. If you want a safe tan, use self-tanner. 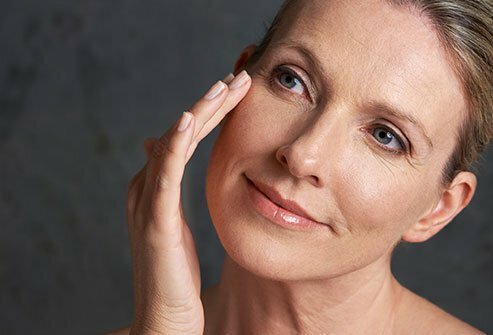 At-home treatments may help you preserve the youthful appearance of your skin, but if you want more dramatic results and want to look years younger, see your dermatologist. Fillers can reduce the appearance of laugh lines and restore volume where it has been lost in an aging face. 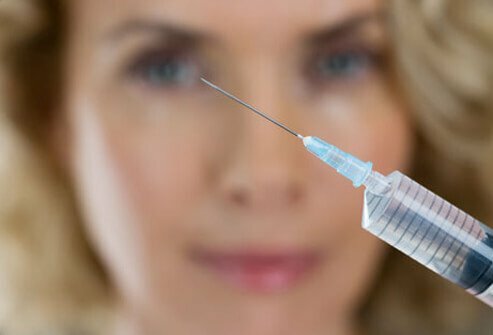 Botulinum toxin can be used to minimize the appearance of lines in the forehead and brow area. You can make skin appear more lustrous by having chemical peels and dermabrasion. These procedures reduce the appearance of age spots and soften fine lines. Laser resurfacing is a more aggressive treatment that can reduce wrinkles and minimize discoloration. Alysia Ryan, makeup artist, Cincinnati, Ohio. Audrey Kunin, MD, dermatologist, Kansas City, Mo. Begoun, P. Don't Go to the Cosmetics Counter Without Me, 6th edition. Beginning Press, 2003. Bergfeld, W. Skincare: A Woman Doctor's Guide, Kensington Books, 2001. Brandt, F.10 Minutes, 10 Years: Your Definitive Guide to a Beautiful and Youthful Appearance. Free Press, 2007. Robin Ashinoff, MD, dermatologist, Hackensack University Medical Center, New Jersey. Robin Ryant, celebrity makeup artist in Miami, Florida.